When learning English you will find that listening comprehension is difficult to improve. Many of my students complain that they just don't understand what native English people are saying. That is why I have written the following articles to help you find interesting and fun way to improve your listening skills. Here I examine the concept of "learn by doing" which I believe applies to English as well. In the beginning this approach can be overwhelming and extremly frustrating but by continualy exposing yourself to oral English on a daily basis you will soon notice a difference. You will be able to understand more expressions and vocabulary used in context. Doing one simple thing throughout the day can make a big difference. Learn how to listen your way to better English here. In the past I recommended listening to the free online radio station, "personal success radio" but recently they went offline. Now that they do not exist what do I suggest students listen to in order to improve their listening skills? Click here to find out my new advice. What about ESL listening courses? Here we explore ESL listening courses and look at their effectiveness. Are they really helping you improve or just making you feel like you are. Some programs are excellent while others are just a waste of your time. Find out why ESL listening programs sometimes don't work. One of the most frustrating parts about learning a language is not understanding. 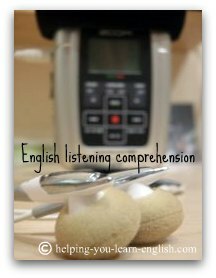 Many of my students say that they can not improve their listening comprehension because they don't understand what they are listening to. This is not an excuse, but rather a reality when learning English. Even when you don't understand what you hear, you are improving your listening comprehension. If you would like to quickly improve your listening skills just correct these 3 mistakes. You will notice a dramatic improvement with minimal effort. The perfect motivation to keep you learning and improving.